As they prepare to welcome the England Women team for a second time this season, Doncaster Knights executive chairman Tony De Mulder says the club is willing to potentially increase the size of their Castle Park stadium to secure further fixtures. England face France there in the Six Nations on Sunday (12.45pm) with Doncaster having already successfully hosted Simon Middleton’s side for the 27-19 victory over Canada in November. That was part of the RFU’s bid to take games away from their Twickenham base and inspire a new generation of not only women players but new fans too. A crowd of 3,876 watched the Canada Quilter Internationals fixture and Doncaster expect that attendance to be improved on at the weekend. It is, then, no surprise the Championship club is keen to continue its partnership with international rugby. De Mulder said: “The RFU were delighted last time with both the organisation from ourselves but also the response of the players and the coaches. “They loved coming here as they were able to train at the same venue all the time. “They came up a couple of days before the game – as they will this week – and they love it. “The only worry I’ve got for the future is that women’s rugby will become so popular we wouldn’t have enough capacity at Castle Park. “But we’d be ready to bring in temporary stands if we had to and – if they did ask about only having 5,070 capacity – we’ll make sure the RFU know that’s our intention. England started their campaign with a 51-7 rout of Ireland last Friday. De Mulder said: “They looked very, very strong at Donnybrook in Dublin – and we’re absolutely delighted to be welcoming them back to Doncaster. “It was a big game in Ireland but now, with France as the reigning Six Nations champions, this one at Castle Park is probably the top match of the whole tournament. “Ticket sales are going really, really well. We’ve sold out the main stand and are looking to have a capacity crowd. The weather’s calmed down, too. It’s going to be a lot warmer. “We were getting a bit worried as if it had been as cold as last weekend it would have made it pretty hard to get the match on with those ground conditions. Financially, hosting Test matches gives the South Yorkshire outfit a considerable boost. Generating income is traditionally hard for Championship clubs and that is no different for Doncaster. “We do struggle, every Championship club struggles,” continued De Mulder, whose own investment has helped fund Knights for so long. “It’s great, then, that the RFU has given us two games this season and it is a real winner for us. Indeed, he said the club has plans to introduce a new side in 2019-20. “We’re starting a girls team in the Academy next year and we have the Doncaster Demons ladies side so gradually we’re building up towards making quite a section for female players,” added De Mulder. “We have a new artificial grass pitch on which we can play endless games so our ground isn’t under pressure any more. “We’re working on that and also on new car parking facilities with the local authorities. England’s player of the match Katy Daly-McLean said after the eight-try win over Ireland: “We had a decent amount of time coming into the game and we worked on what we needed to get better. Last month, the Rugby Football Union brought the number of Women’s 15-a-side players on permanent contracts to 28, as the 2014 World Cup winners seek to bring their game to the next level. Judging by Friday’s performance, the new professional set-up is already paying dividends as England outperformed their opponents in every area of the encounter. 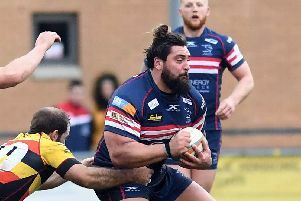 Meanwhile, after a break from the league last week, Doncaster’s men’s team return to action at Championship high-fliers Ealing Trailfinders on Saturday bidding to make it four wins in a row.